In recent years, Visual Studio has added new features and experiences to allow developers to develop their C++ applications for non-Windows platforms such as Android, iOS and more recently Linux. One of the challenges that Linux development brings to the table is making sure your native application works across the wide set of Linux distributions available. We have experienced this first-hand when developing the Visual Studio Code C/C++ extension where we needed to test the extension across a wide variations of Linux distributions. We typically build and test our C++ code on different versions of Ubuntu, Debian, Fedora, Arch, openSUSE and more. Furthermore, there are different versions of the standard C library and compilers which bring their own set of issues. To keep costs low for Linux development we made use of Docker containers on Azure. Through the course of this walkthrough you will need to setup the following, so let us just go ahead do this upfront. Install Azure Command Line Interface which will provide you with a set of open source shell based commands for creating and managing resources in Azure. Use the Windows MSI installer which will setup the right paths in command shell. Docker ToolBox which will allow you to quickly install and setup Docker environment for your computer. Visual Studio, with C++ and Linux Development extension which ships today as a separate extension on Visual Studio extension gallery. A Docker Container is a “stripped-to-basics” version of your operating system. A Docker Image is a read-only snapshot of your software that can be “run” in a Docker Container. Docker containers can allow you to pack a lot more applications into a single physical server than a Virtual Machine can. Virtual machines run a full copy of the operating system and a virtual copy of all the hardware that operating systems need to run. In contrast, containers only require a stripped to basic version of your operating system, supporting libraries and programs and system resources required to run a specific program. Combine this with the additional benefit that Docker containers provide for creating a consistent development environment for development, testing and deployment. Docker is here to stay! Alright with that very short overview on Docker lets go ahead and setup an Azure Docker VM now. The easiest way to create an Azure VM is by using the cross-platform Azure command line tools. Once installed and connected to your Azure subscription, you can manage many Azure resources right from the command prompt. Login into your subscription using the ‘azure login’ command. You will go through the following series of steps shown in the picture below. Once you have logged in successfully to find a suitable image, run the azure vm image list command and provide additional details where you would like your VM to be hosted ‘location’ and the publisher for the VM images. All Ubuntu images on Azure are shipped by the ‘Canonical’ publisher. This will print for you a list of Ubuntu images. For this walkthrough, I will pick up the popular ‘Canonical:UbuntuServer:14.04.5-LTS:14.04.201609190’ image. Alternatively you can pick others from the 16.0 series as well. The Docker Installation documentation provides step-by-step instructions on how to install the Docker Toolbox, which will in turn install Docker Machine, Engine, Compose, Kitematic and a shell for running the Docker CLI. For this tutorial you will install this on your Windows box where you have setup Visual Studio. Once Docker is installed and running we can go the next step which is to install our Azure Docker Ubuntu VM using the docker-machine Azure driver. You will need to replace the subscription-id with your subscription-id and your vm name e.g. hello-azure-docker-cpp. This will run through the following series of command setting up the VM and installing the necessary Docker tools. If you get stuck, you can follow this guide here. Next, set up your shell for the machine we created by running the following command, where machine name is the name of the machine you created. The easiest way to get started with a Docker container is to make use of an existing container. For this purpose, we use a pre-existing Debian container by executing the following command. This will download the latest image for Debian from Docker and start a new container with it. You should see the following command window as you go through this step. You can replace ‘debian’ with ‘ubuntu’, ‘fedora’ or ‘opensuse’ for creating containers for other distros. To build your C++ application on this newly created Linux container using Visual Studio, you need to enable SSH and install necessary build tools (gdb, g++ etc.). Setting up SSH is generally not recommended for Docker containers, but it is required by the Visual Studio C++ Linux development experience today. Attach to your running container by using the ‘docker attach <container-id>’ command and run the following commands to setup SSH. Next, create a user account to use with the SSH connection to the Docker container we just created. We can do this by running the following commands. Replace <user-name> with the username you would like. As a part of the Inbound security rule, Add and Allow an additional custom TCP security rule with the port you chose for your SSH connection as shown in the figure below. You should now be able to SSH into your Linux container using your favorite SSH client application. The and in the command below will need to be replaced based on your settings. First, run the following command on your Linux containers which downloads dependencies required to build and debug. Second, download the Visual C++ for Linux development extension or get it from the Extension Manager in Visual Studio. Please note the Linux extension is only supported for Visual Studio 2015 and above. 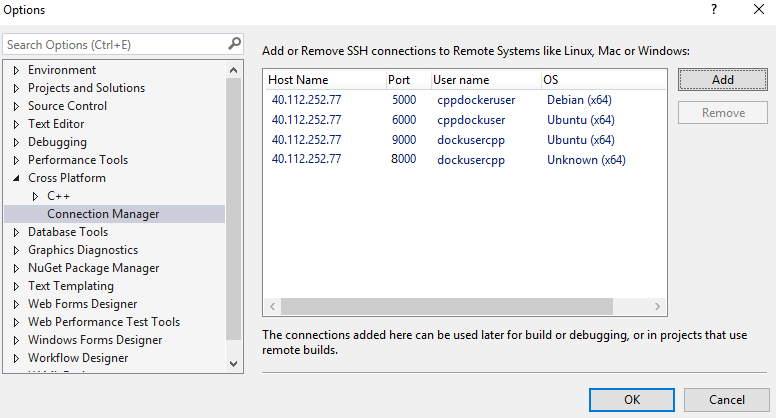 Notice how by using the Docker containers, you can now develop your application on Debian, different versions of Ubuntu, and Redhat simultaneously using one Virtual Machine from within Visual Studio. For this exercise, choose the simple Console Application template. If you want to start with something more rich you can use this simple tictactoe project. You can now start debugging (F5) which will copy your sources remotely, build your application and finally allow you to debug your application. Great! you are now successfully debugging a C++ Linux application running in a container inside an Azure VM. So far you’ve used very basic Docker commands to create your Docker containers in the previous sections. The real power of Docker comes from not only enabling you to instantiate different versions of Linux distros on one virtual machine in a cheaper, more productive manner, but Docker also provides a way to create a consistent development environment. This is because Docker lets you use a Docker file with a series of commands to set up the environment on the virtual machine. A Docker file is similar in concept to the recipes and manifests found in infrastructure automation (IA) tools like chef and puppet. You can bring up your favorite text editor and create a file called ‘Dockerfile’ with the following content. You can now run the following commands to build your docker container with this docker file and get it running! "C:\Program Files\Docker\Docker\resources\bin\docker.exe" build -t debiandockercontainer . Running the ‘docker ps’ command will list your newly created container and you can start with Linux C++ development in Visual Studio. As always, we welcome your feedback and we would love to learn from your experiences as you try this out. This blog is focused on Linux containers, in the future I will also talk about how you can extend your story with Docker containers for your Windows development. If you run into any problems, following these steps you can email me your query or feedback if you choose to interact directly! Otherwise, we are happy to see your comments and interact with you here through comments. For general Visual Studio product suggestions, you can let us know through User Voice.